Here at A Akatuki5, I write about adventures and destinations all around the world in the hopes that I can inspire you to travel to some of them yourself. I love to use my own experiences to encourage people to explore the world – but I don't believe that you have to quit your job and become a full-time nomad in order to do it. In fact, that's an unrealistic goal for the vast majority of people. So, instead of selling you on a dream that isn't really feasible, the goal of this site has always been to show you how you can fit more travel and adventure into the lifestyle that you already have. Keeping in line with the mission of this site, I've decided to launch the 10-Day Adventure Project. This “project” will focus on bucket-list-style adventures you can have in two weeks or less. Many people (and Americans especially) only have two weeks (10 days) of paid vacation days per year, so this project will focus on all sorts of adventures you can have within that time frame. The goal will be to cover a variety of travel styles and destinations, from independent travel itineraries, to long-weekend getaways and city breaks, to reviews of guided tours and excursions. Check out my favorite 2-weeks-or-less holidays below! Want to see all the top sights in Utah and Arizona? This 10-day road trip itinerary visits the Mighty 5 National Parks in Utah, along with amazing natural sights like Monument Valley and Antelope Canyon. Oregon has everything from mountains to waterfalls to wine country to a beautiful coastline. This 10-day road trip itinerary will help you see all the best spots in Oregon – including a couple that you probably haven't heard of before! The Northern USA is another great spot for a road trip. This particular one includes 8 national parks and monuments, along with unique wildlife and history. This itinerary focuses on southern and central Norway, with stops in Oslo, Trondheim, Alesund, Geiranger, and more. This weeklong road trip itinerary focuses on some of Norway's lesser-visited northern islands, including Senja and the Vesterålen Islands. Yes, you can totally visit Norway in the winter! And this itinerary will help you see the best parts of the country, whether you want to see the fjords or the Northern Lights. Want to plan an independent road trip around the Emerald Isle? This 10-day road trip itinerary will help you hit all the best spots in Ireland. Want to head to Iceland in winter, but don't feel comfortable driving around in the snow? Then this itinerary is for you! It's chock full of adventures and epic scenery, but doesn't require you to drive anywhere. This itinerary highlights the very best of South Africa, from its wildlife in Kruger National Park to its vibrant cities like Cape Town and Johannesburg. Looking for a luxury island escape that hasn't been done to death on Instagram? Consider heading to the Seychelles, a tropical paradise in the Indian Ocean. Yes, you CAN explore both the North and South islands of New Zealand even if you only have two weeks. This jam-packed itinerary hits all the highlights – and then some! Aruba makes for the perfect Caribbean getaway any time of year. This itinerary is a mix of adventurous and relaxing, depending on what kind of trip you're after. Scotland's Hebridean Islands are magical – maybe even more magical than the Highlands! And this tour with fun-loving Haggis Adventures is a great way to get a budget-friendly taste of both. While I've loved the tours I've done with Haggis Adventures in Scotland, this one with Highland Explorer Tours is slightly more luxurious, yet still hits all the highlights. Here's a look at Haggis' Highland Fling tour. It's geared toward backpackers/budget travelers, but is SO FUN and really does pack in the best of Scotland in 5 days. This tour made me fall in love with Scotland. How does a themed tour of Scotland sound? This 3-day tour through the Highlands is all about following in the footsteps of the characters and real historical events from “Outlander” – definitely a must for any fan! Want to see the highlights of Ireland and Northern Ireland in just a few days? This tour with Shamrocker Adventures is perfect – and pretty easy on the budget. My obsession with Eastern Europe started all the way back in college, and this 17-day tour (while slightly longer than two weeks) hit every single place I dreamed of visiting, from Budapest to Transylvania to Istanbul. Curious about visiting Russia? This 13-day cruise hits on all the highlights, including major cities, smaller villages, plenty of history and opulent churches. This is one of my favorite guided tours I've ever done! It features all the highlights of Vietnam, fro Ha Long Bay to Hoi An to Ho Chi Minh City. Want to visit Cambodia but don't want to go solo? Booking a tour like this one is a great happy medium, ensuring you'll see all the best spots with the least amount of stress. To be fair, this trip was a little longer than two weeks (it was 19 days), but I really do think that overlanding is THE way to experience Africa! If you've ever dreamed of visiting Egypt but have been hesitant about going on your own, you'll want to read this review of a great 12-day tour that hits all the highlights of ancient Egypt. Looking for a luxury train journey that traverses through some of the most stunning scenery in the world? Then you'll want to check out the Rocky Mountaineer. This budget-friendly tour is a great introduction to South America. Highlights include overnighting in the Amazon and adventuring in Baños. Looking for a fun, laid-back introduction to Central America that includes the best of the jungle AND the sea? Then this 8-day trip with Intrepid Travel is one worth checking out. Are you a Lord of the Rings fan who dreams of exploring New Zealand? Then this LOTR-focused tour is made especially for you. Who says adults can't have fun in Orlando? 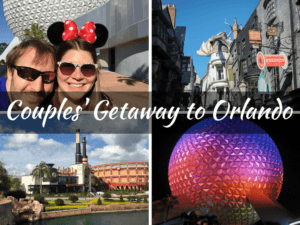 See what fun you can get up to at both Disney and Universal Orlando over a long weekend with your significant other. Chicago is one of my favorite cities to spend a long weekend in in the U.S. Here are all the highlights you can pack into three days in America's capital city. New Orleans is one of my favorite cities in the US for a long weekend break – and it's even better if you go with your best girl friends! Visiting both sides of Niagara Falls makes for the perfect romantic weekend getaway. My (now) husband and I went on a mini-moon to the Finger Lakes region of New York. Here's a look at what you can do there. Scotland's capital isn't huge, but there's still plenty to do here to fill up three days. While Edinburgh is the capital of Scotland, Inverness is the “unofficial” capital of the Scottish Highlands. This guide hits all the highlights you can see in 72 hours. London is much too big of a city to cover in just a long weekend, but you can absolutely focus on one part of the city at a time. Here's how to make the most of a weekend in London's funky East End. Norway's capital city is way cooler than most people realize. With a cool waterfront, both indoor and outdoor art, and some unique museums, there's a lot to do in Oslo over a long weekend. Looking for a great girlfriend getaway? Or perhaps somewhere off-the-beaten-path for a romantic retreat? Yemaya Island Hideaway on Little Corn Island in Nicaragua is perfect for both! Three days isn't really long enough to truly explore Cape Town, but here are all the highlights you can see in 72 hours, from Table Mountain to Boulders Beach. Which destination(s) would you like to see me explore and highlight next? The 10-Day Adventure Project is really all about YOU and how I can help inspire you to fit more travel into your normal life, so let me know what you'd like to see! Would love any advice on Japan. I haven’t been there yet, but it’s definitely on my list! The husband and I are talking about planning a trip there in 2020, maybe for the Olympics! Наш важный сайт на тематику цены на продвижение сайтов в интернете.